It's something I am facing on a daily basis - on Facebook, in Emails and private messages: Women with self-induced thyroid issue who wonder that their body does everything to conserve lean and fat mass. Women who are working out on a daily basis, dieting like crazy and (in their words) "still not losing weight". It does not take a thyroid expert to identify the reason for their problems: They are training too much and eating too little. Just like the 27 women in seminal experiment that was conducted at the Ohio University in the early 1990s. A study I am going to elaborate on in today's SuppVersity article, although I personally believe it shouldn't take experimental evidence to convince people (yes, this is true for men, as well) to stop run themselves into the ground. Low T3 syndrome is also a part of the (Female) Athletes Triad. Said study was conducted by Anne B. Loucks and Edward M. Heath who worked at the Derpartment of Biological Sciences and the College of Osteopathic Medicine at the Ohio University back in 1994. The purpose of their study was to characterize the functional relationship between energy availability and thyroid metabolism to gain insight into the extent of he dietary reform that might be necessary. The scientists expected to find a proportional relationship that would prove the necessity of dietary compensation for exercise energy expenditure to prevent reductions in T3 levels, scientists call "low T3 syndrome". Subjects were assigned to four groups in a monotonic experimental design of energy availability treatments. During the first exercise bout, heart rate at 70% aerobic capacity was determined by monitoring oxygen uptake. Thereafter, heart rate was monitored continuously by means of a Uniq HeartWatch model 8799 (Computer Instruments, Hemstead, NY) and maintained at the previously measured level by adjusting treadmill speed and slope or cycle work load. I know you will be asking, but aside from simply eating more there is no way to cure low T3 symptom. In fact the worst thing you can do is to get a script for T4 from your doc, because this will only elevate the inactive thyroid hormone (=break) rT3. If the heart rate began to drift monotonically, suggesting a thermoregulatory effect, then oxygen uptake was measured directly by gas analysis. Heart rate and Borg scores of per- ceived exertion were recorded at the fourth and fifth minutes of each exercise bout. 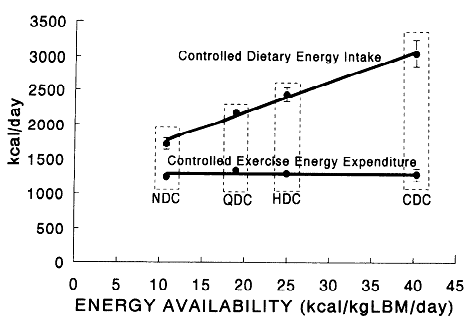 As you can see in Figure 2 the amount of available energy ranged from ~10kcal/kg lean body mass (LBM) in the group who had been assigned to the lowest amount of Ensure, a liquid food product that was the only food source the subjects received during the treatment period to ~40kcal/kg lean body mass in the group with the highest intakes. 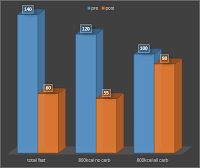 As you can see in Table 1 the thyroid hormone concentration in the two lower groups (10kcal and 19kcal/kg lbm) dropped significantly. With a 10% decrease in free T3 only the changes in the 10.8kcal /kg lbm group were physiologically significant. Bottom line: In a previous experiment (12), the scientists had been able to show that energy availability, rather than dietary energy intake or exercise energy expenditure separately, is the behavioral factor affecting thyroid regulation in exercising women. It is thus not exactly surprising that 4 days on an energy deficient diet in the study at hand were enough to induce a low T3 syndrome in the female participants of the study at hand. In this context it's important to point out that the effect occured only, when the dietary inake fell below 50% of the dietary requirement and that the changes in thyroid hormone levels are restricted to T3 and won't show up on tests that evaluate TSH and T4, only. In studies of the effects of dietary restriction on thyroid metabolism in sedentary obese patients, T3 levels declined only when dietary energy intake fell below a particular threshold and the carbohydrate con- tent of the diet influenced the location of this threshold. T3 levels fell when energy intake was reduced to 800 kcal/day if carbohydrate content was <200kcal/day. Previous studies also highlight that a reduction of carbohydrate intake, will reduce the amount of free T3 by increasing the conversion of T4 to the inactive thyroid metabolite rT3. Irrespective of the fact that a high(er) carbohydrate diet can help women maintain normal thyroid function on a diet, studies indicate that there is an energy threshold below the amounts of carbs in the diet become irrelevant and the T3 levels crash as a simple consequence of a lack of energy in the diet (Spaulding. 1976) | Comment on Facebook! Loucks, Anne B., and Edward M. Heath. "Induction of low-T~ 3 syndrome in exercising women occurs at a threshold of energy availability." American Journal of Physiology 266 (1994): R817-R817. Spaulding, Stephen W., et al. "Effect of caloric restriction and dietary composition on serum T3 and reverse T3 in man." The Journal of Clinical Endocrinology & Metabolism 42.1 (1976): 197-200.